Choose one or several event halls for different purposes. Guests can use Jazz Villa event halls for their wedding, conference, birthday party, banquet or other events. In hall can be up to 30 people. 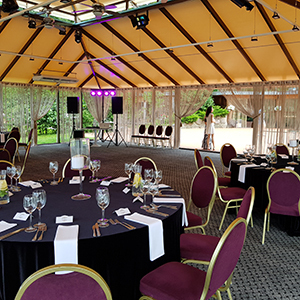 Guests can choose rectangular or round tables for their party or event. On the lakeside near the hotel, an original smoke-bath is set. It is equipped according to the special designer project, which is surprisingly ingenious. Being solid and nestled on the land, it naturally melts into the background. It is equipped according to the special designer project, which is surprisingly ingenious. Being solid and nestled on the land, it naturally melts into the background. The most interesting part is sweating-room. After it had been stoked for 6 hours, massive ancient furnace made of stones radiates pleasing heat, nevertheless, rippling water stream nearby makes air enough saturated. For relax, informal communication and health. You can not only pleasantly, but also useful to spend time in the bath of Jazz Villa. The villa is perfectly fitted for interesting social events and parties. 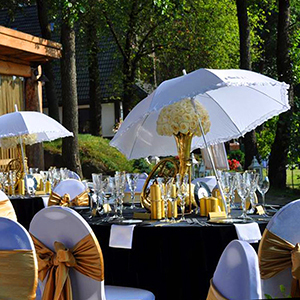 Jazz Villa is already accustomed to organize different receptions, seminars and parties for various occasions. Guests can use Jazz Villa for their wedding, birthday party, banquet or other event. event hall, sauna, outdoor hot tub, fishing equipment, archery. Also you can hire a professional lighting and sound equipment. 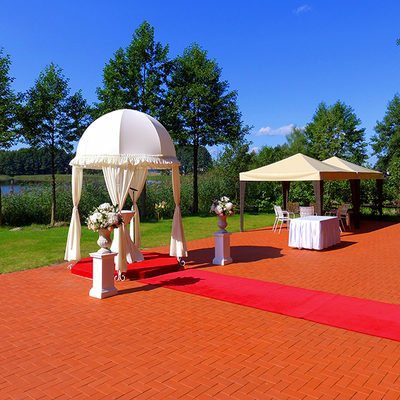 Guests can choose rectangular or round tables for their wedding, plan a wedding ceremony. Decorate territory. They also can hire a professional lighting and sound equipment. a boat, tennis table, bicycles, swing, basketball hoop. Guests can use Jazz Villa for seminar, conference, training or presentation. In Jazz Villa are a projector, flip-cart desk, professional lighting and sound equipment. You can use different halls for seminars, meals and rest. Please, write an email jazzvilla.info@gmail.com or call +370 631 116 77, +370 615 835 73 for detail information. You can choose menu in restaurants Natali and Maisto kalve, Sigmutė. All information about food menu, please, ask directly restaurants.